E- Commerce SEO Services to a Top Seller of Beds, Mattresses etc. 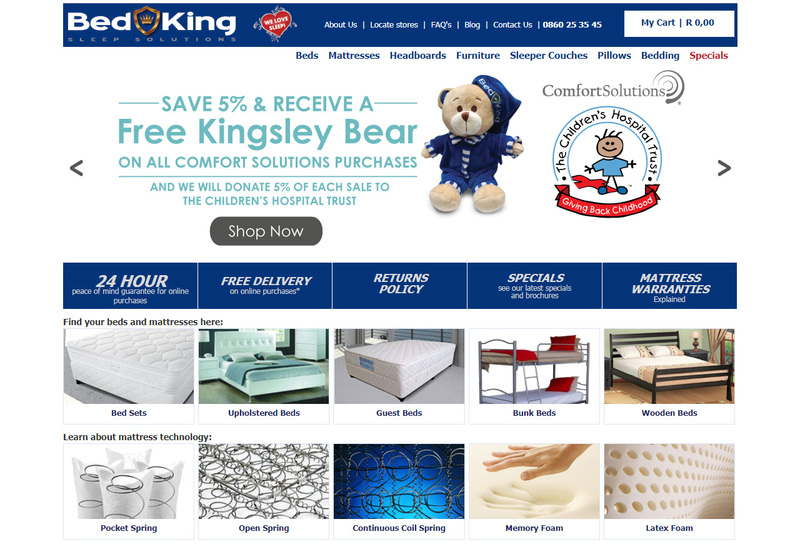 Bed King has been a client of us since 2006. In 2016, we provided technical e-commerce SEO consulting services to strengthen the impact of their newly-launched e-commerce site. The brand remains a valued client of us to this day and the scope of our services has expanded along with their growth in the market. Today this includes a range of our core services such as content marketing, a variety of well-received promotional drives on Facebook, merchant campaigns on major search engines and more. Our overall on and off-site best-practice SEO strategy includes utilising blogging platforms such as WordPress, Blogspot, Tumblr, Weebly and Postach.io are being utilised including directory listings, social sharing and content syndication. As Bed King continues to increase its national presence, Digital Marketing looks forward to complementing our client’s already strong national presence online with an increasingly local focus. This ensures that potential clients will not only find Bed King online while researching products like bunk beds and bedroom furniture but also while they’re on the move. Our hope is to have the brand perfectly positioned during those high-intent moments when consumers reach for their mobile, tap the voice search button and say “Bed shop near me”.